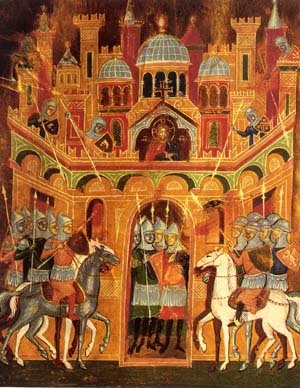 Urban II, Pope from 1088 to 1099, defended the liberty of the Catholic Church continuing the work of St. Gregory VII. He called the First Crusade. 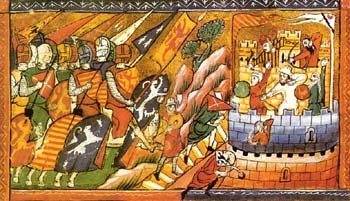 The principal aim of the Council of Clermont was to discuss this Crusade. The people were eager for the announced expedition and finally the Pope attended to their impatient requests. He sat upon the throne that had been prepared specially for that occasion. At his side was Peter the Hermit. Below him was an enormous multitude: Cardinals, Abbots, priests, monks, knights and the people. “Go, brothers, go with hope to the fight against the enemies of God, who for so long have dominated Syria, Armenia and the countries of Asia Minor. They have already committed many outrages: they have taken the Sepulcher of Christ and the marvelous monuments of our Faith; they have forbidden pilgrims to set foot in a city whose worth only Christians can truly appreciate. Are these facts not sufficient to upset the serenity of your faces? “Such a cry would not be unanimous if it were not inspired by the Holy Ghost. Let this be, then, your war-cry to announce the power of the God of Hosts. The date of the Crusade was fixed for August the 15, Feast of the Annunciation. You see the great beauty of this scene. First, you have a saint on the See of Peter. What a wonderful thing! The light in the candelabrum to illuminate all the peoples, the focal point irradiating virtue, a saint sitting in the cathedra whence truth and good should be taught. He was addressing the ranks of warriors of Our Lord and Our Lady to lead them to the fight against their enemies. This man, like an Angel, was filled with zeal for the Holy Places. He could not tolerate that infidels should possess the Holy Land. Why couldn’t he bear this? Because of the offense to the glory of God it represented. Those places are the places par excellence where true worship should be offered to God. Second, he had called for a council to assemble for this reason. 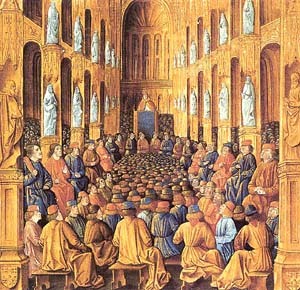 It was the Council of Clermont, a city in France. The scene permits us a glimpse – in small proportion – of all the beauty of the Catholic Church. You have the Pope, Blessed Urban II, who commanded as head over the council; then you have the conciliar Fathers surrounding the Pope, all moved by an authentic zeal for the glory of God – an attitude similar to Angels surrounding God. After that, you have the multitude of the faithful filled with piety and enthusiasm, in whose eyes shone the spirit of fight and sacrifice. Whole families were present, the women and daughters were there to give the men – their sons, husbands, and brothers – their full support. They understood that to liberate the Sepulcher of Christ they should offer the sacrifice of their loved ones leaving for the Crusade. Today one sees many serene and tranquil faces in the street, people looking for the good life, enjoying themselves, ready to tell the latest joke. And even when some of these people have concerned faces, their concern is normally for their private interests. Who really cares about the cause of the Church? In that time men were different. When the Pope challenged them, asking them if they would maintain their serenity or go to fight for the Church, they did not hesitate. They were true servants of Our Lord Jesus Christ. They had the Catholic Church alive in their souls. They were willing to give up the peaceful life, even though it was legitimate. They arose as one man to take the cross and place it on the hilt of their swords, on their standards and shields, and on their breasts, and they made up that invincible avalanche that went forward to regain the Sepulcher of Christ. How different things were then from our times! Fourth, Blessed Urban II said something that should enthuse and encourage us to face our difficult situation today. He affirmed that the unanimous voice of that multitude which called out its decision to take the cross and liberate the Holy Sepulcher proved that the Holy Ghost was acting there. He had the presupposition, therefore, that the Holy Ghost is present in heroic decisions of ensembles of peoples in Christendom. Today, based on that same presupposition, we can ask for and hope that the Holy Ghost will come again to help Catholic warriors to liberate the Holy Church from the progressivist usurpation. The fight we are facing now in many senses is more important than the one to liberate the Holy Sepulcher. So, even if we are weak and sinners, we should ask Our Lady to obtain for us a new coming of the Holy Ghost, in a way similar to His descent on the multitudes at the time of the Crusades to prepare the people then for that fight. We should ask her to obtain from Him the grace that we need to transform us into true Apostles of the Last Times, making us able to restore the Catholic Church in all her splendor and to install the Reign of Mary, as Our Lady predicted at Fatima.